As Coptic Orthodox Pope Shenouda III praised Egypt’s military rulers at Christmas mass in January 2012, Christian youth chanted “down with military rule” from the back of the Cathedral. Sitting in the first row were several members of the Supreme Council of the Armed Forces (SCAF), which had taken power after president Hosni Mubarak was ousted amid a popular uprising in February 2011. Hostility towards the military was triggered by a bloody attack on Coptic protesters a few months earlier. On 9 October, at least 25 Christians were killed and more than 300 hundred injured in violent clashes with the army. That night, in front of Maspero’s state television building in downtown Cairo, armoured vehicles drove over protesters who were marching to denounce discrimination against Copts. “The Church was thanking those who'd killed its children,” recalls Beshoy Tamri, a member of the Maspero Youth Union, a Coptic rights group, who chanted against the military at Christmas mass and had taken part in the Maspero protests. Christians have long been marginalised in Egyptian political life. But many supported the Mubarak regime out of fear of Islamism, despite the discrimination they faced. The pope was often considered the only person entitled to speak in the name of the community. However, with the revolution and a spike in sectarian attacks, many dissident voices started contesting the longtime order. 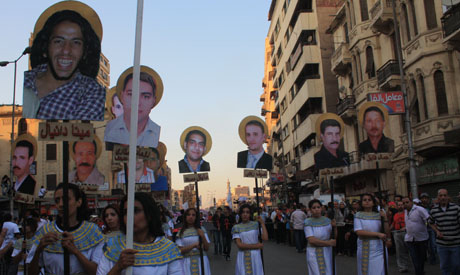 The Maspero massacre encouraged many Christians to take part in subsequent protests against the military rulers, whether to condemn the massacre itself, or later on to denounce the army’s policies during the country’s first transitional period. Today, however, after a year of Muslim Brotherhood rule and the army's popularly-backed removal of Mohamed Morsi on 3 July, many believe the Coptic community is reconciled with the army. According to Ishak Ibrahim, a researcher with the Egyptian Initiative for Personal Rights, the shift among Christians can be partially explained by the military’s charm offensive immediately after Maspero. It increased legal sanctions against sectarian discrimination in October 2011, attended Christian religious ceremonies, and provided a military plane to transport Pope Shenouda’s body during his funeral in March 2012. Those fears were reinforced when Islamists accused Christians of fueling anti-Morsi protests, Ibrahim adds. In December 2012, a Muslim cleric close to the Brotherhood, Safwat Hegazy, warned the Church against “conspiring and siding with the old regime over Morsi’s ouster.” Similarly, the ultra-conservative Al-Gamaa Al-Islamiya's Assem Abdel-Maged accused “Coptic extremists” of being behind the 30 June mass protests calling for Morsi’s ouster, along with communists and atheists. Youssef Sidhom, head of Coptic newspaper Watani, believes it is wrong to link the Coptic position towards the military with Maspero. “The position toward Maspero did not change. There is still a lot of anger, and the matter is in the hands of the judiciary,” Sidhom says. However, there cannot be an automatic rejection of the army and their actions as a whole, he adds. He insists, however, that military officials in power at the time should be put on trial, as they were politically responsible for what happened. He names military police leader Ibrahim El-Damati and prominent former members of the SCAF: Hamdi Badeen, Hassan El-Roweini, Sami Anan, Hussein Tantawi. “We demand justice. They committed crimes and they should be put on trial like anybody else,” Tamri says. Several legal cases were filed following the massacre, but only three soldiers were convicted and they received light sentences of two or three years in jail. A military court tried them in September 2012 on charges of “involuntary manslaughter” for the deaths of 14 protesters. They had acted with "negligence and absence of caution, while driving armoured personnel carriers in an arbitrary fashion ... leading to them hit the victims." In April 2012, a civilian court investigating the use of live ammunition and the killing of protesters at Maspero closed the case due to a lack of evidence. The ruling was confirmed on 31 May after it was appealed by the prosecution. In another civilian case in February 2013, two protesters were sentenced to three years imprisonment for stealing an army machine gun during the clashes. “We are speaking of more than 25 killed and dozens injured and the only result is three soldiers convicted,” Ishak Ibrahim complains. Egypt’s military has repeatedly denied using live ammunition against protesters at Maspero. It has also denied any systematic crushing of civilians with army vehicles and accused protesters of being armed with Molotov cocktails, sticks and swords. Many Christians are still determined to prosecute those they hold responsible for the massacre. “The transitional justice ministry said it would open new investigations into all acts of violence after 25 January 2011. We hope we can keep up the pressure and achieve justice,” Beshoy says. “Something will remain between the army and Christians as long as there is no justice, as long as the criminals are free," he warns. This feeling is still palpable among certain young people at Mar Girgis church. "The army had a patriotic position and supported the people's revolution" on the 30 June, acknowledges Marc Hani. "But this should not mean we forget everything and go back to acclaiming them." The 19-year-old politics student believes new army chief Abdel-Fattah El-Sissi also bears some political responsibility for the massacre because he was a SCAF member at the time. Others, like Amgad Nabil, say they have "blind trust" in El-Sissi, and they might vote for him if he was a presidential candidate. "We were drowning and he saved us at the last minute," Nabil says, referring to Morsi’s ouster. "The least I can do to thank him would be to vote for him." Nirvana Mamdouh, a 22-year-old architecture student, says Christians keep falling for the illusion of security. “We've got used to looking for someone to protect us, even if this safety is not stable,” she says, recalling many Christians’ support for Hosni Mubarak. Today, “the army is not protecting Christians as it is claims,” she adds, referring to the burning of churches after security forces violently disbanded two Islamists sit-ins in Cairo. Egypt is supposed to be following a roadmap back to democracy, and many hope the new authorities will finally fight discrimination and injustice against Copts. "We want a constitution that respects minorities,” says Nancy Emad. The 22-year-old pharmacist says she doesn't want to feel like a second-class citizen anymore. "We have to feel that this is our country. I don't want to think that if I leave for the United States, I will lead a better life."